October 11, 2010 - The U.S. Department of Transportation (DOT) proposed to grant antitrust immunity to two air carrier alliances for services between the United States and Japan, subject to the Open-Skies aviation agreement between the two countries being signed. The Department?s tentative decision would grant immunity to ?oneworld? alliance members American Airlines and Japan Airlines (JAL), and separately to ?Star Alliance? members United Airlines, Continental Airlines and All Nippon Airways. If the decision is made final, the members of each alliance would be able to more closely coordinate international operations in transpacific markets. In the show-cause order, the Department tentatively found that granting antitrust immunity to each alliance would provide passengers and cargo with a variety of benefits, including lower fares on more routes, increased services, better schedules, and reduced travel and connection times. Each proposed alliance would enhance competition, particularly in transpacific markets. On Dec. 11, 2009, the United States and Japan initialed an agreement that would establish an Open-Skies aviation relationship between the two countries once it is signed. Under the new agreement, airlines from both countries would be allowed to select routes and destinations based on consumer demand for both passenger and cargo services, without limitations on the number of U.S. or Japanese carriers that can fly between the two countries or the number of flights they can operate. Parties have 21 calendar days to comment and seven business days to file answers. After this period ends, the Department will review all filings and then issue a final decision. Japan Airlines is an airline headquartered in Shinagawa, Tokyo, Japan. Flag carrier of Japan and its main hubs are Tokyo's Narita International Airport and Tokyo International Airport, as well as Nagoya's Chūbu Centrair International Airport and Osaka's Kansai International Airport. The airline and four of its subsidiaries (J-Air, JAL Express, JALways, and Japan Transocean Air) are members of the Oneworld airline alliance. JAL group companies include Japan Airlines for international and domestic services; JALways for international leisure services; JAL Express for international and domestic low-cost services; Hokkaido Air System, J-Air, Japan Air Commuter, Japan Transocean Air and Ryukyu Air Commuter for domestic feeder services; and JAL Cargo for cargo and mail services. JAL group operations include scheduled and non-scheduled international and domestic passenger and cargo services to 220 destinations in 35 countries worldwide, including codeshares. The group has a fleet of 279 aircraft. In the fiscal year ended March 31, 2009, the airline group carried over 52 million passengers and over 1.1 million tons of cargo and mail. JAL was established in 1951 and became the national airline of Japan in 1953. 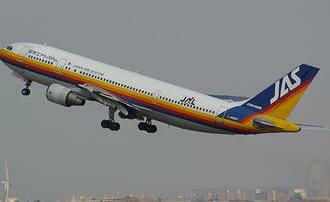 After over three decades of service and expansion, the airline was fully privatized in 1987. In 2002, the airline merged with Japan Air System, Japan's third-largest airline and became the sixth largest airline in the world by passengers carried. The airline filed for bankruptcy protection on January 19, 2010, after losses of nearly ?100 billion in a single quarter.